There are many ways to pimp a soup; seasonings, dumplings, bread layers. 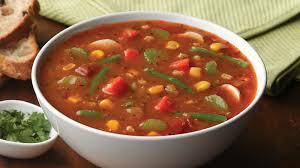 But getting a basic vegetable soup right is easy and useful. When you’re skint or cold or need something you can bang in a pan and leave to simmer then soup is a good option. It’s also the ideal thing to pop into a flask or container than won’t leak and bring into work for lunches (buying sandwiches is a huge drain on weekly income). And that is it, really. All you need to do is fry the finely chopped onion until it softens and goes yellow. Add the potatoes and brown a little. Then pour in the stock and simmer until the potatoes are boiled and softened. Use a hand whisk to blend or w hisk and then season to taste. From there you can add more things. Add carrots or courgettes with the potatoes. Add carrots and then a teaspoon of coriander for a quick and easy carrot and coriander soup. Add chopped tomatoes for some added flavour and bulk. This is one of my favourite vegetable soups that I’ll often make towards the end of the month, or on a Sunday for weekday lunches when I’m especially organised. Start by finely chopping the onion and garlic and frying gently. Cube the vegetables and add to the pan allowing them to fry and colour slightly. After around ten minutes add the stock, spices and seasonings. Allow to bubble away nicely for up to half and hour or forty minutes until everything is soft. Remove the bay leaves and half of the vegetables. Take the pan and blend the soup until it’s smooth using a handwhisk. Return the rest of the vegetables to the pan and stir. Layer the slices of bread at the bottom of the bowl and serve out the soup, chunks first and then liquid on top.